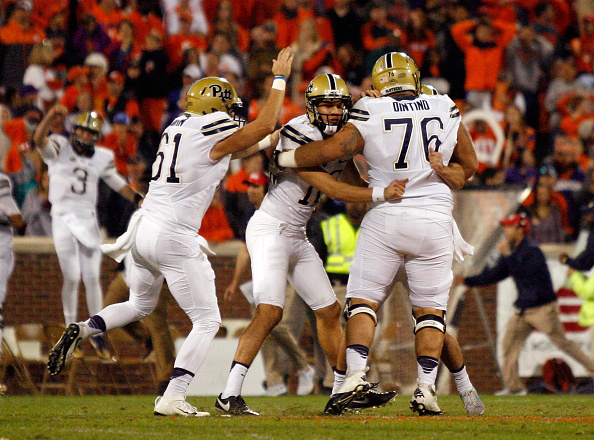 The Pittsburgh Panthers upset Clemson 43-42, giving Pat Narduzzi a signature win to build his program around. Make no mistake about: this upset came as quite a surprise. After losing to Miami 51-28, Pittsburgh was mathematically eliminated from the Coastal division race. With nothing other than pride to play for, one had to wonder what kind of team would show up for Pittsburgh against Clemson. The answer to that question was, “the same team that defeated No. 10 Penn State in the second week of the season”. That’s not to say that the Panthers were perfect. They weren’t. The Pittsburgh defense allowed Deshaun Watson to throw for an ACC-record 580 yards. The Panthers also struggled mightily on third down, converting just 3 of its 11 opportunities. In addition, the Panthers missed an extra point in the second quarter, which looked like it would be the difference in the ball game. But, it wasn’t. Just as it looked like Clemson was going to deliver a knockout blow with less than six minutes remaining, Pittsburgh’s defense rose to the occasion. On second-and-goal from inside the Panther 5, Saleem Brightwell picked off a Deshaun Watson pass, and returned it 70 yards to the Tiger 30. This timely pick fired up the Pittsburgh offense, which scored three plays later to cut the lead to 42-40. The Panther D would come up with another big stop late in the game. With Clemson marching into Pittsburgh territory, the Panthers stopped Wayne Gallman for no gain on back-to-back plays to end the scoring drive. The fourth down stop was especially impressive, as Clemson brought in its jumbo unit – which included two 300-pound defensive tackles – thinking that it could just run over the Panther defense to get the yardage necessary to win the game. However, Pittsburgh’s defense won the battle in the trenches, as Gallman barely made it back to the line of scrimmage. This impressive stand allowed the Panthers to win the game. Nathan Peterman completed two passes to tight end Scott Orndorf – who finished the game with nine catches for 128 yards and two touchdowns – to put the team into field goal range. Chris Blewitt – who missed an extra point and a field goal earlier in the contest – connected from 48 yards out to give Pittsburgh its first victory against a top 10 opponent since 2007 (against archrival West Virginia in the “Backyard Brawl”). The Panthers’ stunning upset shows that Pat Narduzzi’s program has officially turned the corner. Yes, Pittsburgh has no shot at winning the conference title this year. However, with two wins against top 10 opponents this season, the Panthers have proved that they’re capable of beating anyone on the country when they bring their “A” game. Look for Narduzzi to build on that, and possibly return the program to the level it was under Johnny Majors and Jackie Sherrill in the late 170’s.